Thieves rammed a stolen SUV into a downtown San Francisco museum early Tuesday and swiped historic gold nuggets in the latest smash-and-grab theft in the area in recent months. 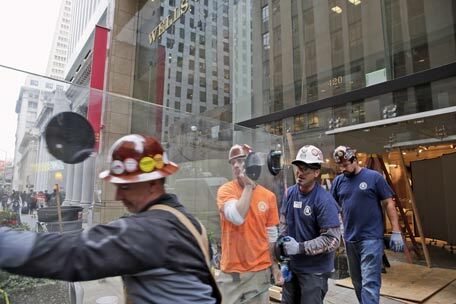 Three masked men jumped from a Chevrolet Suburban after it rammed through a revolving door at the Wells Fargo History Museum in the financial district and held a security guard at gunpoint while taking gold nuggets from a display case. The three men escaped in a four-door sedan driven by an accomplice. The security guard was unharmed. Last week thieves backed a U-Haul van through the front of a Patagonia store near San Francisco's Fisherman's Wharf, loaded it with high-end outdoor clothing and gear and sped off. Across San Francisco Bay, thieves in May busted through the glass at an Apple Store in a bustling shopping district in Berkeley to steal electronics, leaving the car behind. 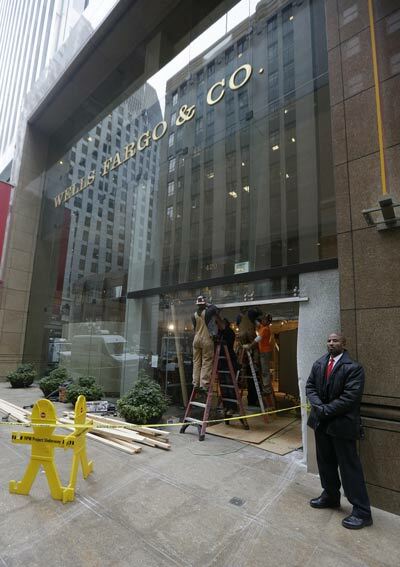 As many as 10 ounces of gold with an estimated value of roughly $10,000 was stolen from the Wells Fargo museum. Wells Fargo officials were still trying to determine exactly what was stolen before determining a more precise loss figure. Dealers of precious metals say they will be on the lookout for nuggets with historical significance that suddenly appear on the market, rare coin dealer Don Kagin said. Melting the precious metal could remove possible markings concerning when and where the nuggets were mined, said Fred Holabird, a mining geologist and an owner of a rare and unique collectibles business in Reno, Nevada. Holabird said the nuggets could be worth two to 10 times the value of gold now selling for about $1,300 an ounce on the open market. Wells Fargo spokesman Ruben Pulido said in a statement that the company is grateful that no one was injured and no damage was done to the historic stagecoaches at the site where Wells Fargo launched in 1852. People walking to work stopped to snap photos of the SUV wedged in the shattered revolving doors.